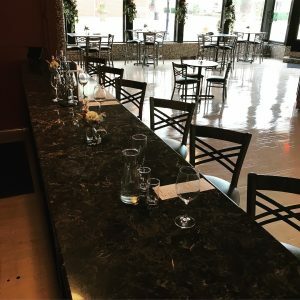 Vin Ami | Zanesville, OH – Wine & friends…Just as it should be! Our vision is to offer an atmosphere that causes a person to exhale a deep breath to relax and unwind after a long day or week. We hope you see the elements of a historical building and some modern touches from our updates. We want our friends and guests to feel welcome, choose a favorite table, and if needed, move a few together for a group. Maybe a seat at the bar? One of the key differences in our concept is that we have opted to only accept reservations for private events and groups outside of normal business hours. We want the relaxed atmosphere to be consistent so if there isn’t a table immediately available when you enter, stick around for a few min or check back after your next stop. Wine is available by the glass or flight from the menu. Another option is to choose a bottle from the shelf as we grow into some favorites that you request. We will prepare the wine and serve it to you properly if you prefer a decanter or a chiller for your bottle. We don’t wish to interrupt your conversations and catching up with friends but will check in periodically. If you need anything, please don’t hesitate to let us know. Please keep in mind that we want you to have a great time with friends, family or simple relaxation so we won’t rush you to the door. We hope you enjoy your time with us and the atmosphere as much as we do! A thoughtful selection of wines may also bring frequent changes to our wine list. We partner with several distributors to help us select domestic and international wines for your enjoyment. There are many winemakers and vineyards that work hard to produce a great quality product but at lower volume than widely recognized brands and labels so availability could be limited. We hope you have an opportunity to try something new on our flights and enjoy a favorite for a few visits. Small plates to serve 1-2 is a focal point for our menu. We have several items to start an afternoon or evening but perhaps move on to a neighboring restaurant for dinner? Chose 1 or 2 to satisfy your appetite and relax with a glass of wine, beer or sparkling water and enjoy the company of others. Expect our menu to change and watch our social media for the “Til it’s Gone Special”.